The animation is fun and cute at times and the charters interact well they try to crack jokes but they tend to be a bit lackluster at time it is cute thought and it has its moments. its a good anime but not grate if you enjoy art you may find it more appealing, its worth watching and making your own option. I haven't laughed this hard since Lucky Star, and as regular readers know by now, I am a huge Lucky Star fan. I went into this anime with reservations. From the screenshots I saw it looked like Shugo Chara or yumiero patisiere. both great shows, but a genra I grow easily bored with. So I was surprised to find little to no magical elements. Its just a fun little romp into the lives of 5 art students. I must say I laughed particularly hard at the power rangers knock off they did halfway through the episode. However, a lot of the comedy does seem to rely on puns or gags. Personally I love this kind of comedy (Bobobo has a lot of this for instance) so I laughed almost the entire episode. While this one kinda snuck up on my I can't help but fall in love, so well was it handled. The characters are all archetypes that remind us of other characters we've fallen in love with. I don't really know what else to say. The problem with reviewing these is that their hard really talk about for awhile. I mean I can't go and attack the storyline and the characters are perfect. The animation is good all around, with some moments being better than others. The art style changes a couple times, but in a show about art students I'd expect nothing less. AHA! I know what to talk about! Until recently I ignored opening until a fellow critic pointed out some good ones to me and now I keep my eyes open for more of the same. GA's op and ed are both quite simple, but by no means bad. The opening fully expresses the show in its own way. As you watch you know exactly what your getting into, and in its own way it tells a story. Now I probably wouldn't put it in a top ten, maybe a top 20, but it is good. The ed on the other hand is far too simple. The music is good (a rarity for ed in my opinion) but the animation used is far too simple, almost like they weren't even really trying. Did they run out of budget? Spend too much on the show? I wouldn't mind that, but it just seemed weird that everything else was so hyper and constantly moving and then we end with this really poorly animated ed. Yes it's another slice of life / comedy anime. But for those of us that really enjoy these types it was great. Though I already own the dvd series I'm happy to see it come on Crunchyroll as it shows they are trying to appeal to other than the hack and slash, mega droid crowds. I enjoy this series almost as much as Hidamari Sketch. This one is a bit more chaotic, but I felt the characters were fleshed out well enough to stand on their own and not require a backstory. However, just as with Hidamari I feel a little cheated because I may never get the chance to see these characters develop over time as I was able to do with Azumanga Daioh. I would like to know what happens to them and how they grow through the years to graduation. Guess I'm greedy, don't want just the slice, give me the whole loaf. i love how they kept the originality in this!I'm telling you,from tomokane being so sarcastic and tomboyish and noyda being so girly and annoying you can really see character in these people!10/10 is what this is! Have your nice art anime and learn from it too! Just like music, art is a great medium to showcase your expressive creativity and progress in life in a colorful, uplifting way. But for those who just joined in the art creativity, how do you improve your art style? What are the important basics that you need to know? Don’t worry, because this anime will give you a nice, general overview on art! How? Let’s see an overview of this anime and find out! Characters: One of our main characters is Kisaragi Yamaguchi, the kind yet klutzy girl who wears what looks like ridiculously large reading glasses…at least in the anime version. She is regularly part of these group of friends [for many activities and overall social time]: Miki Noda, the playful petite who knows how to break the ice, Namiko Nozaki, the mature type who acts as the responsible parent, Miyabi “Kyoju” Omichi, the low-key but very informative scholar who is always prepared with whatever information or materials her friends need, and Tomokane, the hot-blooded, hyperactive tomboy who often brute forces her way through many situations. Meanwhile, you also have the Fine Arts Club for the 2nd group. The leader of the group is Chikako Awara, the spunky, short-tempered type who looks like a cross between Osaka and Tomo Takino from Azumanga Daioh. Her club consists of these members: Mizubuchi, the mature childhood friend of Kisaragi and straight [wo]man of Awara, Uozomi, the serious student, Homura, the casual car maintenance student, and the older brother of Tomokane, a veiled prankster under a weak body. With the exception of “Aa-san” in the Fine Arts Club, many of the characters have very stereotypical traits and don’t offer much of a personality outside of a few standouts (much like in Lucky Star where only one character has a personality). They basically act as an animated relay for teaching all about art, which we will get to in this review. Plot: Since this is plot-less let’s look closely at what this art is all about! Content: The show starts off with one of the various “This show is about to start” cutscenes, as though we’re watching an educational video in class (which isn’t a bad thing for the type of anime this is). The main opening cutscene consists of a made-up kids’ show called “Drawing Fun” which starts off the show. After that and the real opening, we see the characters starting the day at art school, learning lessons in class and learning lessons between friends – particularly from Kyoju – while completing art assignments in the process. Throughout the episodes, they complete their art assignments, sometimes barely, and move on to the next activity or situation. They also go out for any outings that may or may not be art-related, do various activities and some shenanigans, purchase art supplies and many other activities. All of which showcase the art styles in just about many art and color related subjects, right down to the manga insert-like shorts that occasionally pop up in the series. Whether it’s pictograms, visible light, gradients of light, pencil sketching (even SHARPENING the pencil for a particular gradient), collages, photography, modern art, exhibiting art, surrealism or even a quick introduction of different color styles, they do a good job showcasing the subjects. We also occasionally shift focus on the students in the Fine Arts Club and their antics and everyday occurrences. Although it offers a different perspective in the anime, in 12 episodes this is comparable to having the spotlight shifting between two different groups in multiple short times. It doesn’t give us enough time for the characters to develop along with the confusing blur. Nevertheless, they do their great job in relaying the art information to the viewer. Art: For a Moe-type anime that showcases art in general, it offers a lot of fantastic details. The simple yet detailed animations meet with the bold yet soft colors that are well placed within the matching scenery, right down to the static and dynamic background and episode title cards. It’s only fitting that the artists made great use of the color scheme and saturation to match the right colors to compliment each other. On top of that, the shading, especially on the characters themselves, is offered in just the right places that gives life beyond the usual flat colors in typical anime. The contrast is evident even when we differentiate the main and side characters with the background characters. Meanwhile, the art does a good job showcasing the art assignments or situations in the episode. It fits perfectly with the art class theme and really stands out as one-of-a-kind! Music: As the artists work on the art, the musicians explore the different sub-genres of Jazz and J-pop with the occasional rock and funk mixed in. Some of the tracks follow a similar melody and a few tried too hard on certain genres, but they all offer a bright, colorful pizzazz to the scenery, much like the bright colors in the anime. It also provides a cool backdrop whenever the scenery called for it. Like the right colors in an artwork, the music fits really well with the anime and nothing seems out of place. Overall: You may not be the master of the arts in a day, but you will learn a lot about art in general. 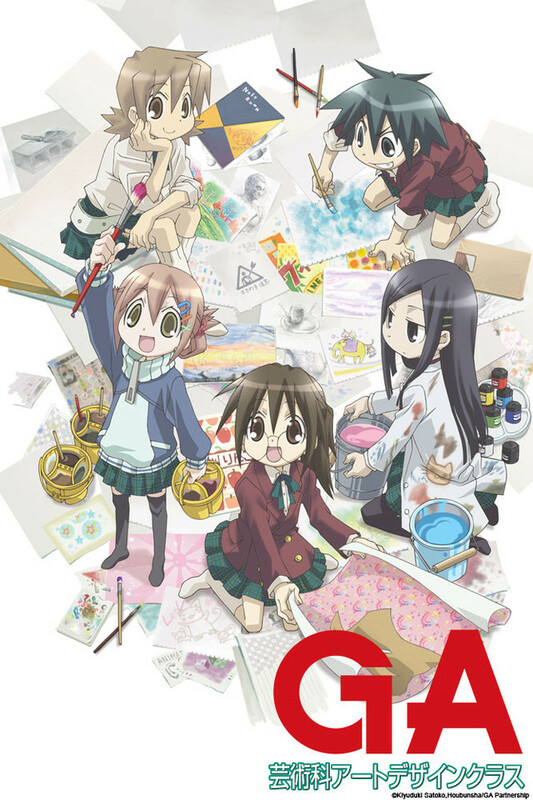 This anime showcases fantastic use of different art techniques, styles, mediums and various shades of the right colors that give the series more detail than a typical slice of life moe anime. Combined with art assignments and situations that are like coming from an art department and you’ve got a great art anime to watch! The only major flaw of the series would be the characters. That being said, if you’re hungry for characters brimming with personality, Azumanga Daioh will readily satisfy it! Other good character-driven shows in the similar genre would be SKET Dance, the Wagnaria series and even the GJ Club. - Impressive art and detail that fits the art school theme. - Teaches a lot of great information about art in general. - A collection of bright and cool music that compliments the scenery. - Some good use of humor that fits the situation at hand. - Having two different main groups of characters in 12 episodes can get confusing. - Kisaragi’s glasses in the anime seriously need some adjustments! - As of this writing, the show feels incomplete after 12 episodes.